The Hurlers Co-op draw was launched at the April meeting of the County Board by former Kilkenny Hurler and current Ballyhale Shamrocks Manager Henry Shefflin. The draw which is entering its thirty eight year provides all Clubs and the County Board with a valuable income stream year-on-year. This year the prize fund is almost €110,000 which will be returned to support the facilities and development programs within the county. 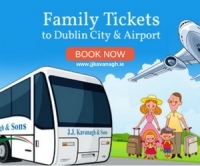 The cost per ticket is €50 which equates to €10 per draw, this provides excellent value for money to the customer. Over the past ten years a total of €4.5million has been gathered in income, over half has been returned to clubs. 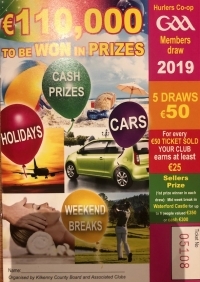 Please ensure your club has a plan in place to sell the Hurlers Co-op draw tickets, ensuring a maximum return with no risk to the club, over the next few weeks. Click here for ticket images, detailing prizes, club returns etc. 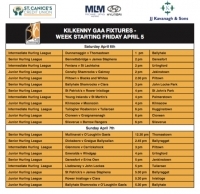 The 2nd round of the local St Canice's Credit Union Senior hurling league, the Michael Lyng Motors Hyundai Intermediate hurling league and the JJ Kavanagh & Sons Junior hurling league takes place this weekend. The action kicks off on Friday evening with the meeting of Erin's Own and Dicksboro in the St Canice's Senior hurling league in Clara at 6.30pm. There are nine games up for grabs across all grades on Saturday including the Junior Football County Final between Young Ireland's and Barrow Rangers in Tom Walsh Park at 2pm. Sunday sees seven games go ahead across all grades with throw-in for all games at 1.30pm. Please support all competitions, entry charges remain the same as other years with adults €5. The 2nd round game between Thomastown and Young Irelands was played last weekend with Thomastown running out victors by one point on a scoreline of 1-14 to 2-10. 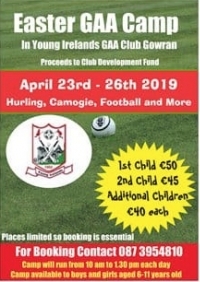 Young Irelands GAA will host a Hurling, Football and Camogie Easter Camp from April 23rd - April 26th. it will operate from 10am to 1.30pm each day. Places are limited so booking is essential. Click below for full details. The Kilkenny Junior County Board launched their competitons on Thursday last at Nowlan Park. The Junior board has been given the responsibility of managing and staging the All County Junior games, all Junior ‘A’, ‘B’, ‘C’ and ‘D’ league and championship games. They have full responsibility for the Under 19 competition. Chairperson of the Junior Board John Lacey welcomed all the club delegates and club PRO’s to the launch. 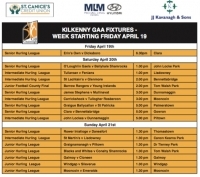 This weekend sees the start of the local leagues, the St Canice's Credit Union Senior league, the Michael Lyng Motors Hyundai Intermediate league and the JJ Kavanagh & Sons Junior league. Following a very successful 2018 season with both Ballyhale and Dunnamaggin being successful nationally its no wonder we are looking forward to the 2019 season. Best of luck to all players, mentors and clubs in the season ahead.